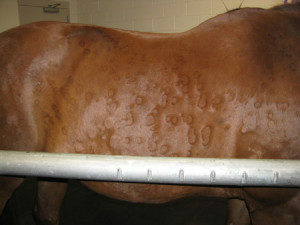 Have you ever brought your horse in from the field, only to find he is covered with hives? Or has crusty little lesions which are compulsively itchy? Or perhaps your horse inexplicably starts to shake her head to the point where she is unrideable? Any of these could be an allergy. The symptoms of skin allergies in horses range all the way from itchiness to breathing difficulties to a worst case scenario of anaphylactic shock. What is making your horse itchy? The cause of skin allergies in horses is often notoriously difficult to pinpoint – it could be dust, mould, pollen, insect bites (especially Culicoides), chemicals, foodstuff (rarely), vaccines or drugs. Your vet will likely do a physical examination and make an intelligent guess based on the nature and location of the symptoms, your horse’s surroundings, the time of year and various other factors. If you need a more accurate diagnosis, he might do a microscopic evaluation, a serum allergy test or intradermal skin allergy testing. What is actually happening in your horse’s body to cause this? Your horse’s immune system works like an army during a foreign invasion. First, it must recognise the ‘intruder’ (aka the antigen, in scientific terms) as being foreign and dangerous. Then, it sends out soldiers to fight off the infection. One of the ‘soldiers’ sent out by white blood cells is called Immunoglobulin E (IgE). IgE binds onto mast cells, causing them to release stored histamine, which by various means (like swelling, itchiness, discharge), ‘kills’ the ‘intruder’. This is all very good when there is a threat of infection from a pathogenic bacteria. But, an allergy is when the ‘army’ makes a mistake and over-reacts by sending out huge amounts of histamine even when the ‘intruder’ is harmless – a dust mite or a component of food. 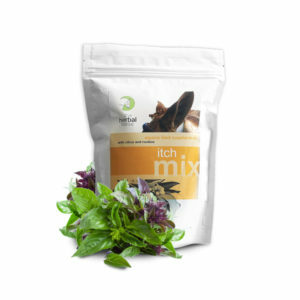 Itchiness, scratching, swelling, breathing difficulty, etc is the result. What is your vet likely to prescribe? It is at this point that you are going to probably call the vet for your swollen, itchy or wheezing horse. And chances are your vet will prescribe cortisone. Cortisone will fix the allergy, in most cases, by simply acting as an anti-inflammatory. And, if the allergy is at all life-threatening, it is a very good thing as it can save your horse’s life. Long term use of cortisone, however, is not a good idea. Because it suppresses the immune system, it makes your horse far more vulnerable to infection. It also weakens bones and messes with the insulin pathway. Another common treatment is antihistamine drugs, which act by blocking the histamine. The disadvantage of antihistamines is that they ideally need to be given before the horse has contact with the allergen. Some of them also have potent sedating side effects. Is there a natural alternative? Of course, the best and most effective treatment is to track down exactly what is causing the allergic response and eliminate it completely from your horse’s life. Unfortunately, this is sometimes extremely difficult to do. Citrus fruits contain molecules called bioflavonoids which have the effect of stabilising the mast cells, discouraging them from breaking up and releasing their cargo of histamine. If histamine has already been released, Vitamin C has the effect of detoxifying excess levels. Externally, apply Apple Cider Vinegar to any bald or itchy spots, as many times per day as you can. And you can add a swig to the feed as well. Have you ever brought your horse in from the field, only to find he is covered with hives? Or has crusty little lesions which are compulsively itchy? Or perhaps your horse inexplicably starts to shake her head to the point where she is unrideable? Any of these could be an allergy. In this article we uncover what allergies are and what you can do to help.